I am asked about the browns. It is the most difficult one/color to put into a classification. I was reading up on what was done for the Wycliff poodles. They had made a brown line classification, so my idea of sorting out the Barbet family was a good one! Keep in mind that most of the "re-incarnated Barbets of the 80's and 90's" were black and that there were very few of anything other color (except white, brought by the Poodle Kennel Haut Paquis). There are even articles written about how rare brown was in the Barbet. It was rare because they were all poodles. It was in 2005, 2006 that brown started coming out in litters. 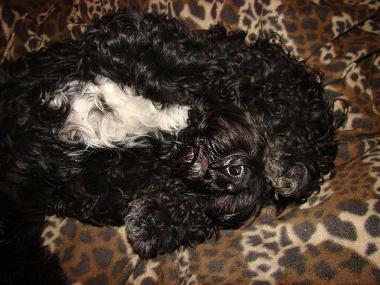 That is not a long time ago, but we do quickly forget that the Barbet is a dog that comes in colors...not just black. That is part of the beauty of the Barbet.Its colors....See below. Bali, whom some of you remember is the Barboch' I picked up at Mrs Pêtre's when she was a pup. She was to be going to Finland for someone who had reserved her. She was with me for a week and then I took her to Paris for her to fly to Finland...nice little girl, as all the Barbochos are. When you get to the site, scroll down. She was CACIB and BOB at the show. The photos of all the dogs are magnificent( Kudos to the photographer). 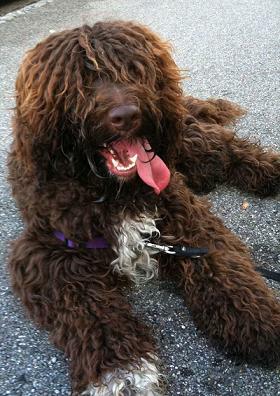 Slow down when you see Bali*, then look at the Spanish water dog, the Cao, the Irish and the Lagotto. That's how I like to see them: looking different! Pay attention to the Schapendoes,the Briard and the Cao de Serra de Aires ..and look at his feet which are beigy.Interesting. These dogs and more are all shepherds and were at some point in a same family. *Yes, Bali could be a bit curlier, like my Ulysse, but the morphology is more important than anything else. Bravo to the judge. Betsey and Bacchus done did their job: 6 pups! 5 girls 1 boy. Photos coming up on Wendy's site. As a matter of fact, you'll get there easily if you take the link on the post below. Bravo Wendy's team! Another step forward for the recognition of the Barbet in Great Britain! Already!.. My, my. Am having a hard time believing it, but I'm not the only one! Daddy Caya can't believe it either. Stay tuned, starting on Tuesday. Pilsudski once said: " Nation that doesn't respect its history, has no dignity in present and no future". Food for thought sent to me by a foreign Barbet aficionado.I happen to deeply believe in that thought. 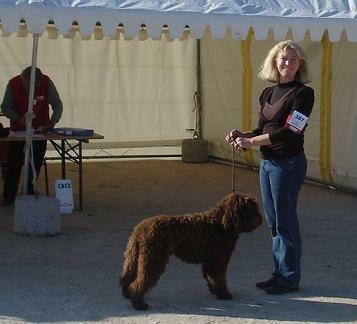 CACS and preselected 8th group.Django de la serve de la Chapelle d'Alexandre, brother to Djimo below!Yippie! !